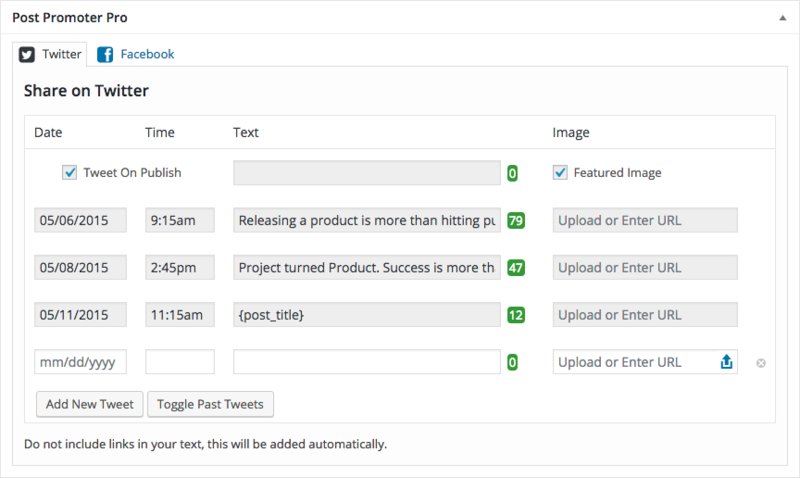 Schedule all your social media shares, right from within WordPress. Increase visibility. Get more leads. Engage your followers. Just install and sign into your social media accounts. Its that easy. Visualize your results in Google Analytics with Post Promoter Pro's integrated UTM tracking. We're here to answer any Post Promoter Pro related questions you have with friendly, email-based support. Let your author's automatically retweet their content from their own accounts. With Google Analytics eCommerce Tracking, you can see the affects Post Promoter Pro has on your sales. This extensible plugin is built from the ground up, using WordPress actions and filters that allow you to adapt it for your specific needs. Share to your favorite social networks. With built in support for Twitter, Facebook, and LinkedIn (and support for others on the way), you'll be able to reach your followers wherever they are. No 3rd party services, or additional apps are needed. Schedule sharing to all your social networks right from within your WordPress admin. Since it's built in, Post Promoter Pro just becomes part of your editorial flow. Quickly view and manage all items you have scheduled to share. You can easily delete an item or choose to share it now if you wish. If I can boost my site's traffic and engagement while also lessening my work load, I've done something right. Post Promoter Pro does exactly that by handling all of the scheduling and posting for me. I can't recommend it enough. I’ve been using Post Promoter Pro since day one and have seen an instant boost in engagement and website traffic across posts shared to Twitter. This is an exceptional plugin and a definite must-have for your social media strategy. The difference Post Promoter Pro has made in my site traffic and user engagement has been nothing short of astounding. I can't recommend it enough to anyone who wants to truly leverage their social media presence! License keys automatically renew at a 30% discount from the purchase price. All purchases are subject to the terms and conditions of use.